Large earthquakes can cause tremendous damage to our daily life, often leaving previously unrecognized structural failure patterns on the surface as well as in the underground. These failures may be caused directly by seismic waves, but why do they emerge so unexpectedly? This unexpectedness is due in part to complex interactions between earthquake rupture process and seismic wave radiation and due in part to dynamic effects of seismic waves on near-surface structures, both of which have not been fully understood yet. Conventionally, earthquake rupture is modeled in a kinematic way and seismic radiation is calculated based on this kinematic model. However, earthquake rupture and seismic radiation are dynamically interacted in the source field, where near-surface structures may be damaged in a way not easily understandable by conventional models. Such dynamic interaction should be a key for better understanding of near-source structural damages. Uenishi (this issue, pp. 28-49) reviews some of the unexpected mechanical features of earthquakes from a rupture dynamics perspective, both theoretically and experimentally. He suggests, contrary to our intuition, that an earthquake rupture source on a geological fault can spontaneously lose its stability to radiate a pulse of fault slip regardless of the exact distribution of the external load acting on the fault. The slip pulse expands along the fault. If the fault is a boundary between two elastically different blocks in a bimaterial system, strong Mach waves can be induced on one side of the fault. These Mach waves may cause enormous ground shaking and serious damage in a concentrated area. 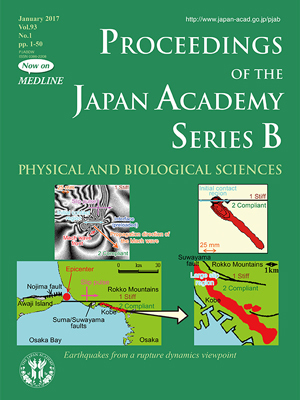 He argues that this mechanism explains the most severely affected "damage belt" in Kobe City that was unexpectedly found immediately after the 1995 Kobe earthquake, Japan. He also proposes that near-surface structures subjected to seismic waves serve as supplementary but powerful "seismographs" that can sense locally generated waves of particular, sometimes unfamiliar, characteristics.